Any welder worth his salt knows how difficult and how rewarding TIG welding is. TIG welding is a very fine art and produces the cleanest and the most beautiful welds. But to be able to pull off, you’ll need a lot of patience, skill, and, of course, a solid TIG welding machine. By Gregory Sanders: This article has been updated to reflect the most accurate information regarding tig welders available for those who are interested in welding. The best 6 available have changed, and information has been added to assist individuals in finding the best tig welders currently available on the market. The FAQ has also been updated. We looked at many of the TIG welders on the market currently and scoured the reviews. After much research, we believe we have come up with the 6 best TIG welders for the money. If you’re looking for power, then look no further than APH Alpha. Dishing out a whopping 200 amps and with a range of 100-220 V, this machine is one of the most flexible on the market. Combine that with amazing arc stability, AC/DC capability and 60% duty cycle, and you get an excellent tool for even the finest of welds. Though the welder is an astounding product in itself, the accessories aren’t the greatest. We are talking here mostly about the regulator. It seems that the factory regulator is not precisely calibrated, and you will get a discrepancy between how much argon you think you have left, and what you actually have left. Overall, this is a splendid machine, save for the regulator. AHP Alpha is still the best TIG welder for the money. You can read our in-depth review of this welder by clicking here. The Everlast PowerArc does not have quite as much power as the APH Alpha but is a fine welder. This machine operates at peak 140 amps, but has incredible arc control, making it perfect for very fine welds. The welder has an automated hot start, which disables the electrode and prevents it from sticking and ruining your weld. It is one of the lightest and the most portable welders on the market. Unfortunately, the welder is a DC only. That being said, you will not be able to do very fine welding on aluminum, but for steel, it is more than capable of delivering high-quality welds. If you’re planning on doing fine welds on steel, then Everlast PowerArc is your machine. While The DC limits it a bit, it is a very good choice for steel welds. We've reviewed the 160STH version of this welder. You can read the review here. If you require flexibility in the extreme, then Forney 324 is just the one. This 190-amp welder can perform stick, MIG, and TIG, so you get three machines for the price of one. Incredible arc control and good amperage also make Forney a very desirable welding machine. However, all those good qualities are overshadowed by the machine’s lack of DC mode. This welder is not meant for heavy duty welding but should do a fine job for aluminum. The machine’s duty cycle is only 20% at 190 amps, which limits it to smaller, lighter jobs. If you want a versatile light duty machine, then Forney has got what you need. A good choice for the hobby welder but it is not meant for industrial use. Need a little cutting done as well as welding? Then look no further than the Lotos CT520D Welder. This amazing machine combines a stick and TIG welder with an incredibly ample 50A plasma cutter. 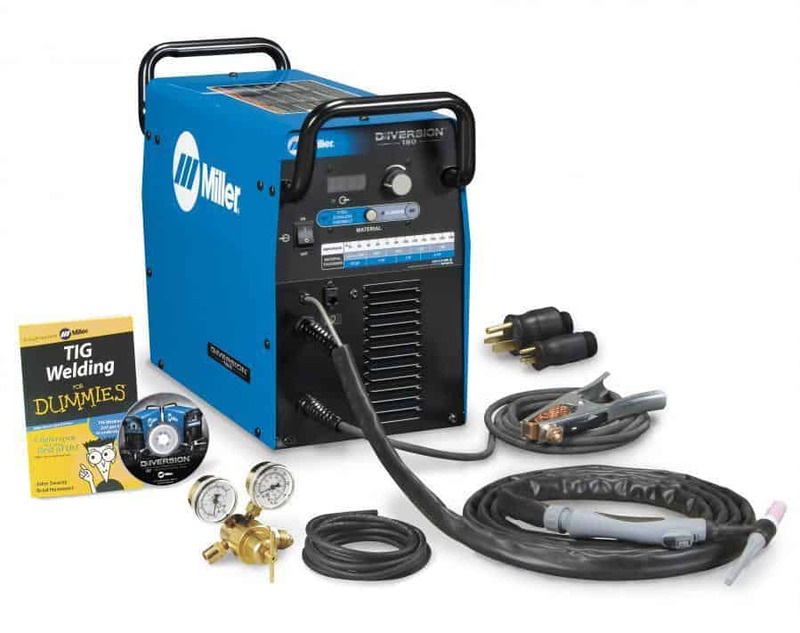 This welder packs a punch, delivering a power outage of 200 A for both stick and TIG welding. Unfortunately, this machine is DC only. Considering the amperage on the machine, welding aluminum is impossible, as the metal will twist and probably be burned through. Of course, if you intend to use it for steel, then you’ve found your welder. Like we said, this welder is powerful but limited. Its 200A is too powerful for aluminum, as the welder does not operate with alternating current. When steel is in question, well, that’s an entirely different story. There are few manufacturers so well known and highly regarded as Miller Electric. Their Maxstar welder is a true testimony of how simple, powerful and durable welding machines can be. For steel work, it is hard to find a better machine, and the Maxstar can handle anything from 0.020’’ to 3/16’’. It can also do stick welding in addition to TIG welding. Unfortunately, the machine only operates on direct current, making it unsuitable for welding aluminum of any kind. If steel is your deal, then the Miller Electric Maxstar is the machine you’ll want. It is exceptionally powerful and has amazing arc control, making it a good choice for a job shop or industrial use. Lastly, we have another combo machine – the Primeweld CT520D. This welder combines a 50-amp plasma cutter and a 200A stick and TIG welder. Besides its incredible power, Primeweld is also exceptionally efficient, offering a duty cycle of 60% at max amperage. Again, this is a DC only welder. That being said, it will do well for steel, and the 200 amps will easily weld 24 gauge stainless, but it is not a good choice for thinner materials. Again, this is an excellent and versatile machine, much like the Lotos, but it has the same drawback. The welder is only DC, and it will not do well if you intend to weld aluminum. For a TIG welding machine to be top notch, it will have to have a certain set of characteristics. These characteristics will determine what kind of material you can work with, and how solid your weld will be. TIG is very versatile, and, provided you have the right machine, you can weld anything from ¼’’ aluminum to 24 gauge steel. The first thing to look out for is the amperage range of the machine. The bigger the amperage range the machine offers, the more versatile will it be. A machine that has an output range of 5-230 A will allow you to weld pretty much anything. That being said, a good machine should also have a good performance at low amperage. For the machine to be truly flexible, stability at low amperage is vital, as it will give you more control over the arc. At low amperage, the arc can get bouncy, and you will be tempted to up the amperage to steady it. However, if you’re working with thin pieces of metal, higher amperages may cause you to burn right through it. Another thing the machine needs is AC/DC capability. If you’re working with steel, then DC is quite enough, but if you’re working with aluminum, you will want your welding machine to be able to use AC current. AC current allows the welder to clean the oxidization on the material and weld it at the same time. Of course, if working with AC, you will also want to have a balance control for the AC, as it will allow you to attune the welding to the metal itself by lengthening or shortening the cleaning and welding cycles. The last two features important for a TIG welder are heat control and good duty cycle. Heat control will allow you to work on thinner materials without burning through them, while a good cycle will allow the machine to work longer on any given amperage. Ah, an age-old question, isn’t it? Usually, this comes down to which one do you prefer more. However, there are some actual differences between the two types of welding. First off, the difference between the two is the way they weld. MIG (metal inert gas) welding is performed by feeding a wire constantly into the weld. TIG (tungsten inert gas) welding uses a long welding rod that is fed into a welding puddle. In essence, an MIG machine allows you to operate with one hand. With a TIG machine, you will need two hands to operate the head and the rod you’re feeding into the pool. Another difference with the two is the speed at which you weld using these methods. TIG welding is very slow. It may produce an excellent finish, and you will never have to do any cleanup, but for greater weld lengths, you will probably turn to MIG. That being said, MIG is faster, and you will be able to cover more ground more quickly, but for a very fine finish, MIG is not so great. In essence, you may look at them as art vs. functionality. TIG welding is used for shorter stretches of welding and finer materials, while MIG welding is used when you want a strong weld that will hold a larger construction. Remember, the most important thing about choosing the right type of welder for the job is focusing on the type of material you’re intending to weld and the environment you plan to weld in. Thoroughly assess what you’re welding first, and then choose one of these awesome machines accordingly.